A new trading strategy; hopefully it will prove to be consistent………….. Given the rather disappointing straddle trades of late, I have been experimenting with some charting strategies to see whether or not it could develop into something more consistent and permanent. 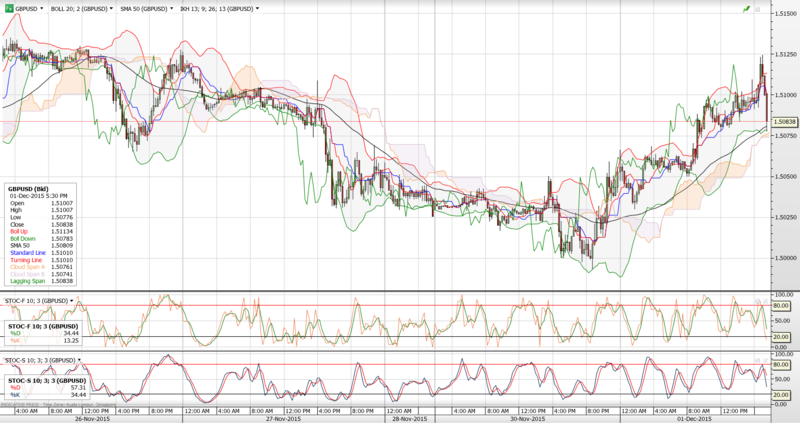 Please look at the 15 minute GBPUSD price chart overlayed with Ichimoku and 50SMA. I decided to try out a simple strategy of looking at the Ichimoku together with the 50 day SMA. I realised that every time the 50SMA cut from below or from above, the GBPUSD will either strengthen or weaken correspondingly. So I decided to try out this strategy, so last night at about 10:22pm, at the level of 1.5030, I decided to LONG the GBPUSD at this level with a SL of 1.5o00. This afternoon at about 4:55pm, I decided to square the position at 1.5112 for a trading profit of 82bps. Will continue to monitor this strategy and see whether there is some consistency in it or not. By the way, any of you haven’t yet asked me what are my settings for my Ichimoku? « Remember our AUDUSD Call Option?